MODE 3 is a high-resolution screen MODE, introduced on the BBC Micro Model B and supported by the entire BBC series including the Archimedes. It provides an 80 × 25 monochrome character display for terminal applications, such as bulletin boards and mainframe access. It also uses slightly less memory than MODE 0. To make the display roughly as tall as other MODEs (=256 scanlines), MODE 3 allocates 10 scanlines per text row, making 250 scanlines in all. Since the VDU routines and the hardware are designed for 8 scanlines per row, the bottom two lines are left blank, not mapped to any part of memory. As the display area is no longer contiguous, the MOS disables graphics functions (all PLOT commands, CLG, GCOL, cursor coupling, the graphics origin and graphics window.) All other functions including screen editing operate as normal. 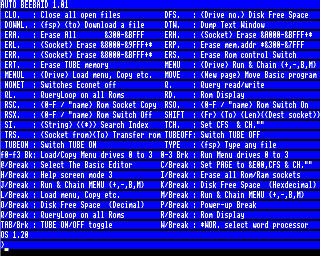 Although 384 bytes of display memory are off screen at any one time, these are not available to programs. If used unofficially they are prone to corruption, unless the program guarantees that no hardware scrolling will occur. When hardware scrolling moves the start of display memory, the mapped area will extend right up to &7FFF and wrap around to &4000. As with MODE 0, the bandwidth (pixel rate) is 16 MHz -- too high for the televisions of the day. Characters are recognisable at close range, thanks to Acorn's carefully designed character set, but a monitor is required buying for prolonged use. Compounded by the unusual tall pixels and large memory footprint for a monochrome display, few games have adopted MODE 3 and so it is used mostly for business applications -- such as terminal emulators. There is a listing in The Micro User to remove the blank lines from MODE 3, although it does not re-enable graphics. This page was last modified on 12 January 2019, at 15:24. This page has been accessed 3,840 times.